Portable baseball fencing is always a must when all you have is an open field. It improves the value of a field with the local community. There are many local groups in any community that love baseball, from little league to softball the size of the outfield needs to change. Portable baseball fencing allows for that added excitement of scoring homeruns that you would not get with an open field. If your community or organization can not afford a portable baseball fence at the moment you can also set up bids to use the fencing. Local leagues would love the chance to make their games feel more like the real thing and with portable baseball fencing you get that. The fence would be paid off in no time at all. Using portable baseball fencing is not hard at all, two people alone can generally have it set up within a half hour. Just imagine how fast it would be set up with a whole team putting it up. Portable Baseball Fencing is not for baseball alone. It could also be used for local community gatherings or get togethers. It can even be used for other sports depending how large the field is, Example: soccer, football, or Frisbee fun. In the below image is the set up for Little League, Softball and Baseball. 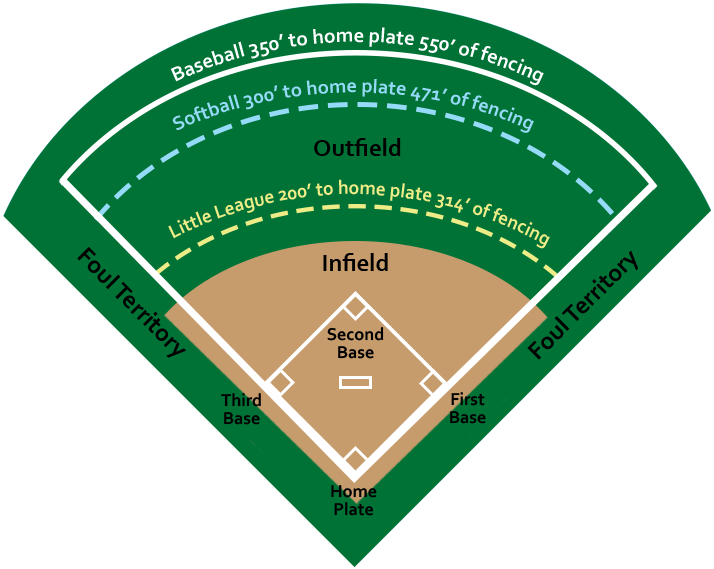 Call us today at 800-878-7829 to get your fields set up with a portable baseball fence!